When speaking about increasing taxes on business on Feb.16, Rep. Jack Pommer stated, “Business does not care about Colorado.” I bet IBM, Roche, Seagate, Amgen and other businesses in Boulder County would disagree. They have all invested significantly in his district, providing jobs and tax base for many years. And who does he think provides the money he is busy spending? Sorry Representative, we can’t all work for the government. As a matter of fact, 84% of us work for private businesses. His comment shows a complete lack of understanding and appreciation for the companies that have afforded the citizens of Boulder County jobs and such a beautiful place to live. These companies don’t stay in Colorado because it is a “business friendly” state. I understand that the legislature has to balance the budget. But demeaning the people, who ultimately provide the State with income, and its citizens with jobs, seems extremely insolent and disrespectful. Pommer as sharp as they come? I rarely comment on, and even rarely write a post about, Open Forum letters in the Times-Call. But there was one statement made in the Saturday February 20, 2010 Open Forum that was just too much of a hanging slider to pass up on. Color me skeptical, but I found the endorsement of Longmont City Council member Karen Benker by Colorado State Senator Brandon Shaffer fairly ironic – and pretty pointless. Make no mistake, this was tactical as Mr. Shaffer ran against Ms. Benker’s opponent Katie Witt for State Senate last year. People can point out that Mr. Shaffer beat Ms. Witt, but he isn’t on the ballot this year. His brand, along with Ms. Benker’s and the entire Democratic Party has sunk at such a pace in the last year that even surprises me. But back to the irony: As I’ve written in many other places, Ms. Benker has a problem with transparency in regards to Colorado’s Sunshine Laws. Well, you know what they say about birds of a feather (they tend to flock together, in case you didn’t know). Mr. Shaffer was recently in the news over some of his own transparency problems. Funny how when elected officials are term limited, they feel free to go hog wild and disregard laws and ethics. Basically, an endorsement by Brandon Shaffer isn’t worth the newspaper it’s printed on. Oh well, nevermind, another term limited Democrat who can’t follow the law. Are there any honest ones at all? Now Pommer is taking possibly illegal contributions? The fun never seems to stop with Representative John “Jack” Pommer and campaign finance laws. One might ask why I’m on Part 3 of this saga, good question. If the paper that covers most of his district (that would be the Times-Call) was doing its job and covering it as it should, I wouldn’t have to bother. But it’s not, and I don’t understand why. This isn’t opinion; it’s fact, it’s news. It was bad enough when he was clearly in violation of late or no reporting owing $20,000 (found here) and then finally paid the fines, but not all of them (found here). The only people who seemed to notice or care where his apologists who saw something inspirational about an elected official caught cheating. Once it got more visibility and hits at Examiner.Com, they became truly unhinged. Here’s some info for those that don’t know, although I’ve said it repeatedly: I was the original Longmont Examiner and part of the original class of Examiners, which now number over 1,600 nationwide. Last year my wife took over that job as I no longer had time for it, and has been getting way more traffic than I ever did. She was exactly what they were looking for, and is consistently ranked in the top tier in her category. Quite a feat for someone who writes about a little place called Longmont. She made no secret of who she was married to (although I don’t see how that really matters) through her bio and a profile of what I do. Another point I made publicly was how she was taking over the majority role in our Voter Registration Drive (VRD) called Vote! Longmont, and has written and spoken publicly about it. This Pommer issue was right up her alley as she had just addressed this at a Longmont City Council meeting about a related subject. She is more than capable to speak to these issues and doesn’t need me or anyone else as a “source”. Nor does she need a disclaimer any time she writes who her significant other is. It’s idiocy that this even has to be explained, right? See, we are what I like to call (I’ll speak slowly) a “team”. We usually investigate and write about different things, but sometimes they cross, like this Pommer story did. I even warned her of the nutjobs that would come after her over what was a pretty fair treatment of Mr. Pommer – way more kind than I was. And they didn’t disappoint, right on cue. Nevermind that every part of the story was true, they just couldn’t have this kind of coverage, and the messengers must be attacked as “pushing an agenda based on lies and false objectivity.” And this was after it was reported Mr. Pommer admitted his mistake. But that doesn’t matter. “On the April 16 report, Pommer lists campaign contributions from registered lobbyists and special interest groups made on February 5. The date is significant, as it falls exactly a month into the legislative session. 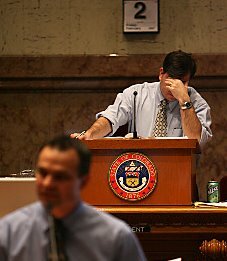 Under Colorado campaign finance law, it is illegal for lobbyists or special interest groups that lobby to give or solicit money for the campaigns of state office-holders while the legislature is in session. Here’s a heads-up (you obviously saw this coming), I wouldn’t be surprised if the Longmont Examiner (full disclosure: that’s my wife) covers this in more detail as it’s as much or more up her alley than mine. Apologies to all you normal, common-sensical people for wasting your time having to explain the obvious. Others apparently require it. So much for the supposed partisan attack machine. Yes, someone to look up to and admire. Actually, by the quotes given below, sounds a little Forrest Gump’ish and hapless. Unlike some other whiners in town, I won’t stomp my feet DEMAND you all admit I was right. The comment at the end of the Face The State piece is a good one: all you chumps who contributed money to his campaign, did you know you were funding this kind of ineptitude? Yes, he wrote the check from his campaign committee funds. Jokes on you! A Boulder lawmaker is socked with $20,000 in late fees for missing numerous finance-report deadlines. And, really, there’s not a good explanation why it happened, says Rep. Jack Pommer. The Boulder Democrat missed multiple campaign-finance report-filing deadlines and racked up about $20,000 in late fees over two years. “I screwed up a lot of paperwork,” said Pommer. Lawmakers who miss monthly disclosure deadlines accrue fines of $50 a day. Part of Pommer’s debt, which began accruing in 2007, was sent to a collection agency and amassed more late fees. Pommer, a member of the legislature’s powerful Joint Budget Committee, on Tuesday wrote the secretary of state’s office a check for $15,000 taken from his campaign account. The withdrawal wiped out his funds on hand. Pommer said he had no new expenditures or fundraising to report, and it was a matter of logging on to a state website and pressing a button. The delinquency was first noted by Face the State, a conservative blog and news site. The lack of disclosure incensed Colorado Ethics Watch. Pommer also missed deadlines when he first arrived at the House but asked then-Secretary of State Donetta Davidson to waive the fines. She did. Pommer, a former businessman, acknowledged that bureaucracy has never been his strong suit. “I had a great business partner, who was really good at paperwork, which is why we didn’t go out of business,” Pommer said. Hours after a Face the State report exposed Rep. Jack Pommer, D-Boulder, for owing close to $20,000 to the state for fines relating to delinquent campaign finance reports, he appeared in the Secretary of State’s office, check in hand and ready to settle. Pommer forked over $15,000 to the Secretary of State, writing a check from his campaign committee. He has appealed to the Secretary of State for a waiver of the balance, which includes $4,050 for his latest delinquent report and outstanding fees from the state collections agency. Details of his assessed penalties and appeal for a waiver can be seen here (PDF). Either Secretary of State Bernie Buescher, a Democrat, or Deputy Secretary Bill Hobbs will make the final call on waiving the balance of fees owed by Pommer. It’s good to see that Pommer finally filed his report from January and was so quick to pay his outstanding fees once they were publicized. But writing a check for $15,000 from his campaign committee raises another issue: would his donors be glad to know their generous contributions went to pay late fees for irresponsible filings? We think not. Pommer did not return calls for comment. “He sits on the powerful Joint Budget Committee and chairs the House Appropriations Committee“, sounds sort of like US Representative Charlie “tax cheat extraordinaire” Rangel (Democrat – NY), doesn’t it? These types that make the tax rules for the rest of us, yet can’t be bothered with following any rules. “Since 2006, Pommer and his registered agent David Kirk have filed at least five delinquent reports, one of which is still accumulating fines.” “Pommer successfully ran for re-election in 2008, and has yet to file his report on contributions and expenditures due January 15, 2009“. Apparently you can see all of these reports, including being sent to collections, at the Secretary of State’s website (view it here click on View All Scanned Documents). Mr. Pommer and Company appear to not be very responsive to email, or snailmail to his home address or his registered agents address. What a great example representing us! (also from Face The State) “Weaning somebody off a subsidy is God awful painful when somebody gets used to having somebody else pay for them. When you take that money they howl, they scream, and they fight like crazy to keep it.” Oops, was his mic supposed to be on? While I find the old time western imagery of his “God awful painful” description entertaining – sounds like something straight out of “Old Yeller” – he accidentally let out the leftist argument for keeping people down and nearly into servitude with these social programs that do far more harm than good. This is that age old complete nonsense that people have bought into for decades, that the Democratic Party is for the little guy. Can this permanently be put to rest? It’s one of the biggest lies ever told. Keeping people in their place through intentional separating based on circumstances (the left is superb at class warfare) often is nothing but intentional or unintentional racism. Do people at times need help? Absolutely, but the left’s idea of help is permanent reliance on government mostly for the purpose of votes and office retention. Are there exceptions? Are some of these types genuinely concerned for the plight of these people? Perhaps, but those are diluted by the ones doing it purely for political reasons. With Mr. Pommers admission here, he just doesn’t want to have to put up with the racket made by his constituents who are so used to all this free government cheese. He knows he’ll be reminded “hey, we voted for you, we expected this to continue” just like Betsy Markey is being reminded how she got into office and what’s expected of her. Of course the irony in Mr. Pommers case, and no doubt hundreds of other representatives at various levels, is that they, while they campaign, tell these same people “remember what I’ve given you (actually what the taxpayers through the government have given you) when it’s time to vote. Those big bad other guys may cut it off, don’t forget!” Sounds like mobsters, but that would be giving mobsters a bad name. If you’d like to contact Representative Pommer, I’d like to say he can be reached (but it appears he can’t be reached) at (303)866-2780 or jack.pommer.house@state.co.us . Good luck. It’s baaaack. Once again our elected representatives at the state capitol have decided that your vote and your voice comes second to theirs. For the umpteenth time, they want to get Colorado out of the business of having to deal with the Electoral College system and go along with this “National Popular Vote” movement. It’s a “movement” alright, if you get my drift. This years model is House Bill 1299, sponsored by Longmont’s own John “Jack” Pommer, Democrat – District 11 (pictured). He also was onboard with the earlier versions of this nonsense, as I’ve written about extensively. This time though it didn’t originate in the State Senate like the past versions, usually sponsored by Brandon Shaffer (another one of our illustrious local representatives), and I hope he’s seen the light on this issue – but I doubt it. Ironically, the House is usually where the previous Senate bills went to die. Hopefully, one of our other local representatives Paul Weissmann will reprise his role and put this in the political graveyard where it belongs. I’ll remind again that a similar measure went before the voters in Colorado in 2004 and was soundly defeated, rejected by 65% of the voters. But the main sponsor Andy Kerr, Democrat – District 26 (pictured), similar to other pushers of this idea (Brandon Shaffer, Ken Gordon, etc) thinks the legislature should overrule you, even though a vast majority of you voted against this. So far only a bare handful of states have gone along with this scheme, equaling a whopping 50 Electoral votes. It wouldn’t kick in until enough states approved this scheme equaling 270 Electoral College votes. But these types have a long view of things with their systematic watering down and killing of what they call a “living Constitution”. But that aside (and that’s a lot to put aside) it’s just plain ridiculous for some states to use one system for electing a President, and others to use some half-baked scheme as the other. Think it’s so great? Put it to the voters, again. Why don’t they? Why do they circumvent the voters and pass this as quietly as possible in state legislatures? Because they know what will happen, the 2004 vote is proof. How would you feel if you, along with almost 700,000 other Colorado voters (equaling 65.9% of the voters), voted one way but a newly elected representative tried to overturn that result, more than once? Worse yet, how would you feel if that representative voted to take away the right for you to vote on that issue again? That’s exactly what current State Senator Brandon Shaffer did with Senate Bills SB06-223 and SB07-046. These two bills, which Senator Shaffer co-sponsored and voted in favor of, would’ve effectively overturned Amendment 36 (this amendment would have changed the way in which the state apportioned its electoral votes). The latter senate bill had an amendment to it that would “refer to people under referendum”, Senator Shaffer voted NO. Bottom line, he wanted to undo the voters will in 2004 and not give them a chance to be heard again on this issue. Why would he do this? These bills were the brainchild and pet projects of Senate Majority Leader Ken Gordon. You didn’t think Mr. Shaffer moved up the ranks to Assistant Majority Leader in the Senate so quickly just on looks, did you? When you’re a good soldier for your leader and your party, there are perks. I asked the question, but didn’t get an answer, as to how often Senator Shaffer voted against his own party. On all the important bills that I looked over he towed the party line straight down the line. Even if that meant undoing and silencing your vote. Bipartisan? Independent? Hardly. Tell Mr. Shaffer you don’t like your vote played with and vote NO on retaining him in his State Senate District 17 seat. Other local representatives of note on this issue: Representative Jack Pommer (Dem-11) voted similarly to Senator Shaffer, and is running for re-election. Representative Paul Weissmann (Dem-12) should be commended on this issue for killing it in his committee.